Noctilucent clouds are one of the atmosphere’s most ethereal natural wonders. They form high in the mesosphere, about 80 km (50 mi) above the Earth’s surface, and are rarely seen. In July, 2018, NASA launched a five-day balloon mission, called PMC (Polar Mesospheric Clouds) Turbo, to observe them and photograph them. Last fall, the team captured the stunning image above of a sunrise from space from about 25,000 meters above the Earth. “To our knowledge, Sunrise Soar II captured the highest resolution images of sunrise ever taken from the edge of space by a high altitude balloon flight,” Gonzales told Universe Today. In images taken from over 36,000 meters, absent are the reddish sunrise colors that we see on Earth because of the atmosphere. Their PURSUIT capsule cost about $500 to put together initially, but their total cost per flight is only $40. The crew consists of twelve different students and recent graduates from various colleges. Gonzales said he formed Project Soar and put together the team as a hobby. 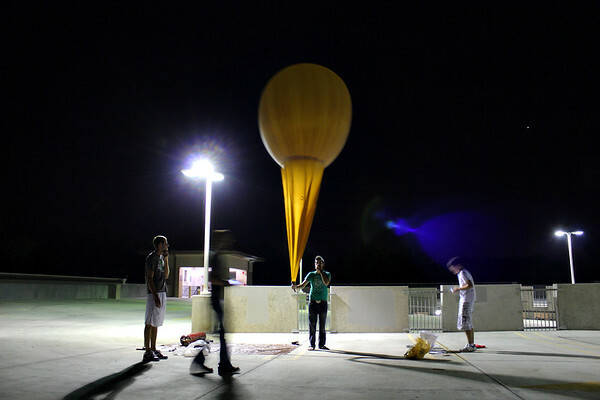 The team hopes to do several more flights soon. See more images and videos, and read detailed reports about the team’s adventures at their Project Soar website.